Britain’s 2008 Olympic and Paralympic cycling team has been granted the freedom of the city of Manchester after their stunning performance at last year’s Beijing Games. A total of 34 medals were brought home by the Olympic and Paralympic cycling squad, and representatives from the team were present at a ceremony in Manchester City Hall on Saturday. 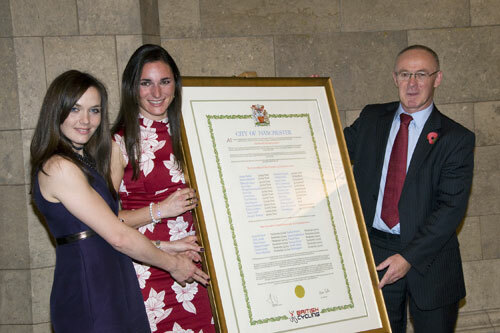 Victoria Pendleton, Sarah Storey, Jody Cundy, Chris Newton and Wendy Houvenaghel were on hand to accept the honour on behalf of the Beijing teams. “It’s a great honour for the GB Olympic and Paralympic Cycling Team to be granted the Freedom of the City,” said Team GB performance director Dave Brailsford. Many of Britain’s Beijing medallists were back in action at the Manchester velodrome at the weekend for the opening round of the 2009/10 UCI Track World Cup. Riders from the Sky+HD and GB teams won 10 out of 17 possible gold medals against an international field. Manchester velodrome plays host to the UCI Para-Cycling Track World Championships this weekend (November 6-8), where more British medal-winning performances are expected.